Looking picture perfect at Flower Piggy. Grilling with charcoal is so widely considered to be superior to using gas for the task that King of the Hill was able to build 13 seasons of jokes on main character Hank Hill's preference for propane. 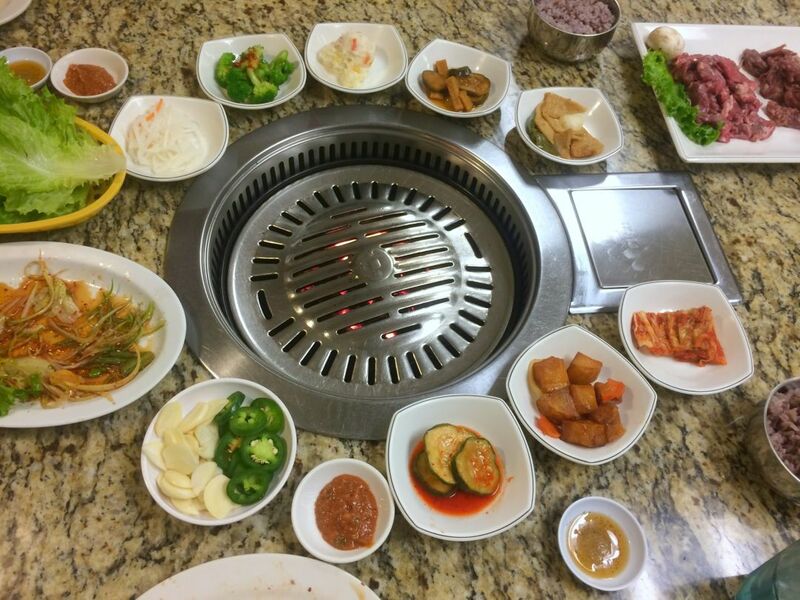 Nonetheless, most Korean barbecue joints, especially in the U.S., are on Hill's side with a reliance on the "clean-burning fuel." 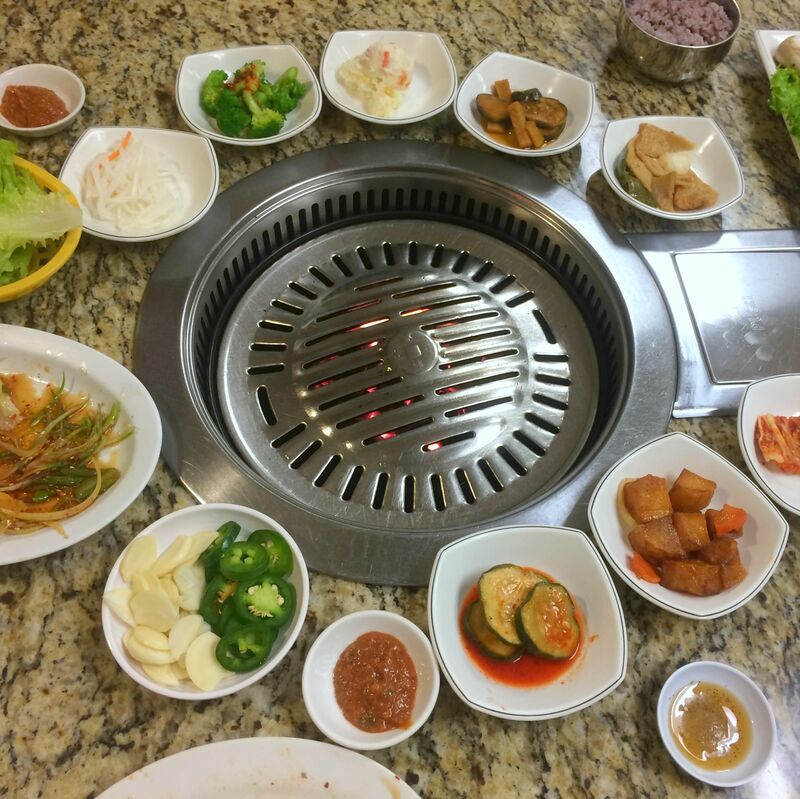 In fact, we only know of two KBBQ spots in Houston that specialize in charcoal grilling. Obviously, it was our duty to try both to determine not only which restaurant is superior, but also whether burning coals really are all that. 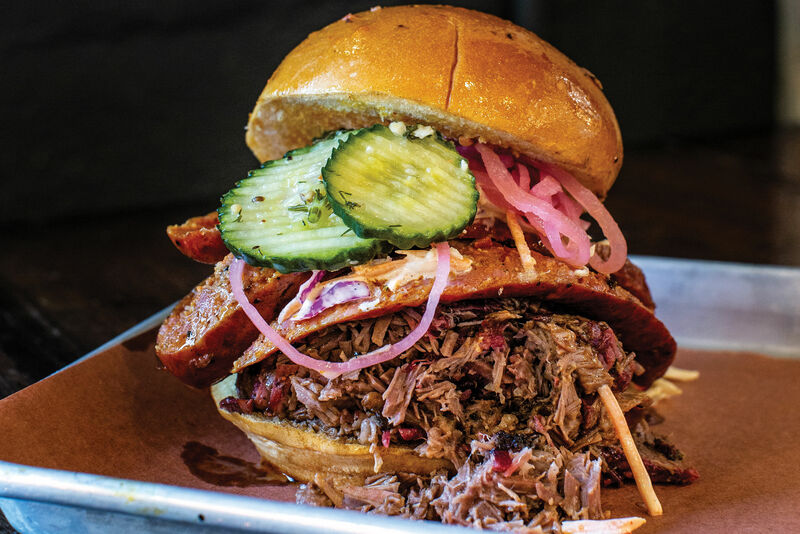 For years, BBQ Garden has built a reputation based in large part on its late night appeal—it's open until 2 a.m. every day of the week. Flower Piggy Korean BBQ, alternatively known by its Korean name, Kot Dae Ji, took over the space formerly filled by Nam Gang in 2015. Which one should you choose? We weigh the pros and cons below. 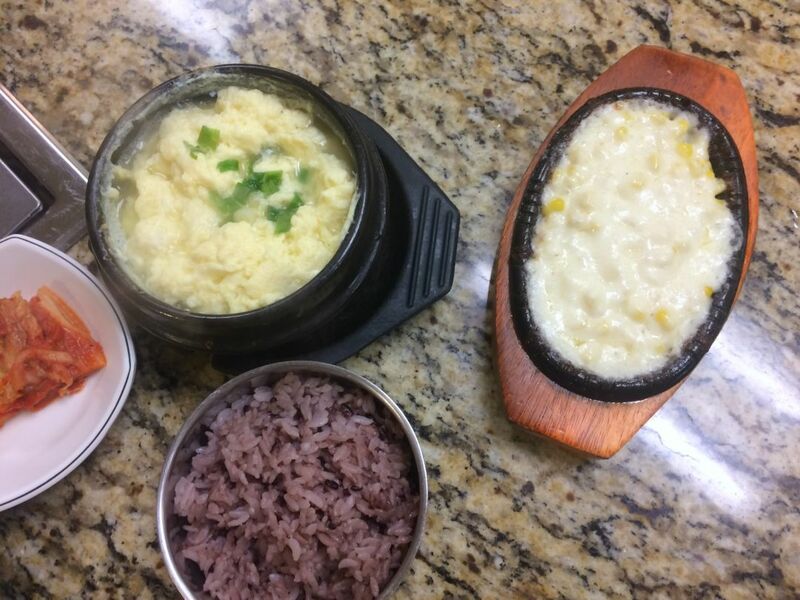 Besides the banchan, a steamed egg, corn cheese, rice and kimchi soup all come with every barbecue combo at Flower Piggy. BBQ Garden: There is no complaint about privacy here. Most tables are sectioned off in cubbies with swinging doors, which creates a bit of a Wild West saloon feel. Limerent couples shouldn't get too hot-and-heavy, though, at least at first. A trio of servers was extremely pushy when it came to grilling our meat. We've been doing this our whole lives and have our own methods. At BBQ Garden, that simply would not do. The pair of women making the rounds insisted that we cook our meats in a particular order and keep them on the solid part of the griddle where they stewed in their own marinades rather than touching fire as they should. When we felt like a break, they insisted on throwing the rest of the flesh onto the heat despite our protestations. But when we were ready to pay and leave, they were nowhere to be found. It took nearly as long to get a check as it did to eat. Flower Piggy: Turns out there are both gas and charcoal grills at Flower Piggy, a fact we only learned when a server started to turn on the gas. We asked if there was still charcoal as well and were swiftly moved to another section. Well, once we were able to verbalize what we wanted. Unfortunately, communication wasn't the strong suit of the young lady we saw the most, partly due to language issues but apparently more attributable simply to "teenage stuff." But everyone in the restaurant was pleasant and eager to say "Hello," even if they weren't always able to help. And when it comes to KBBQ, a little space can go a long way. BBQ Garden: In a way, BBQ Garden had an unfair advantage. 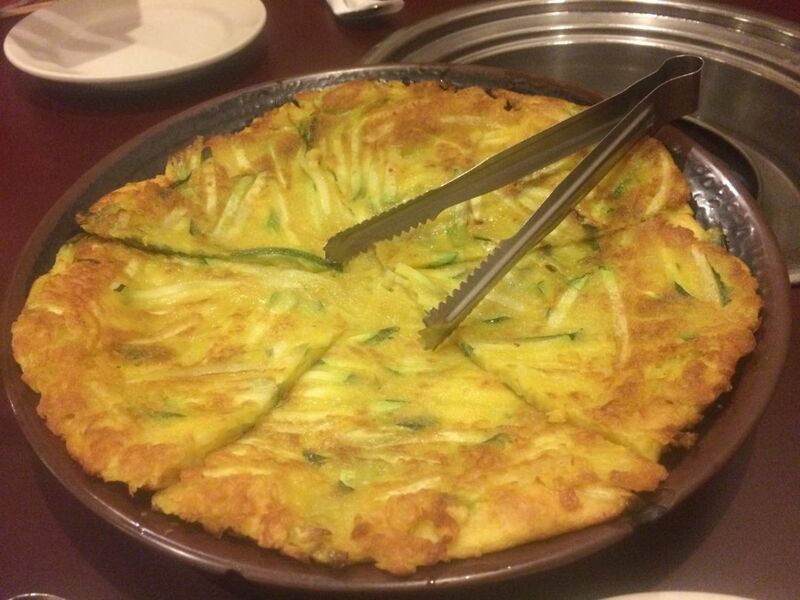 The friend with whom we visited it was in the mood for jeon, or Korean pancakes. We thought it made seasonal sense to order the one labeled on the menu as "pumpkin pancake." Turns out, that actually meant thin matchsticks of zucchini. Nonetheless, we weren't disappointed. The eggy pancake reminded us powerfully of a Dutch pannekoek. A side of vinegared soy sauce amped up the placid flavor. No question, we would return to BBQ Garden for any of its four pancakes, including oyster and kimchi versions. The range of banchan that came with the barbecue, however, was less inspiring. Despite the website's trumpeting "FREE daily made side dishes," the eight small bowls sparkled with neither freshness nor flavor. When we end up focusing on the chile-flecked lettuce leaves of the salad, there's a problem. Flower Piggy: The salad was nearly identical to BBQ Garden's here, but with nine brighter, more varied banchan, we paid it far less mind at Flower Piggy. We didn't order a jeon or any other starter, but was amply satisfied with two kinds of spicy pickled cucumbers, tangy daikon, sweet roasted potatoes and meaty fish cakes, among other hits. And that was before the hot sides hit the table. The kimchi jjigae was full of meat but wan in flavor. Corn cheese was more cheese than corn, but for some that may be the goal. The steamed egg bubbled away as moist and fluffy as we could have hoped for. Extra points also for remembering to bring us rice (we had to request it at BBQ Garden), and for the fact that it was not white but purple multi-grain japgokbap. Bulgogi on the grill at BBQ Garden. 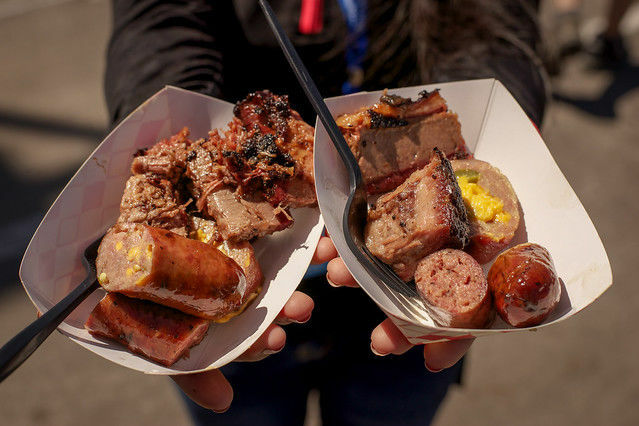 BBQ Garden: There are 17 different individual options, including multiple cuts of pork and Angus beef. However, combos are all extra large and therefore expensive. Four kinds of beef, three kinds of pork, shrimp and squid just don't make sense for a small party. That meant some tough choices. Bulgogi or galbi? We went with the former, which turned out to have a disappointingly bland marinade. Pork in a spicy marinade was a better bet. Thin pork steaks were still thicker than most KBBQ meats, which meant a grill-crisped outside and juicy interior. A server cut them into manageable pieces with scissors when they were ready to eat. We asked for medium spicy and presumably got "white people medium spicy." 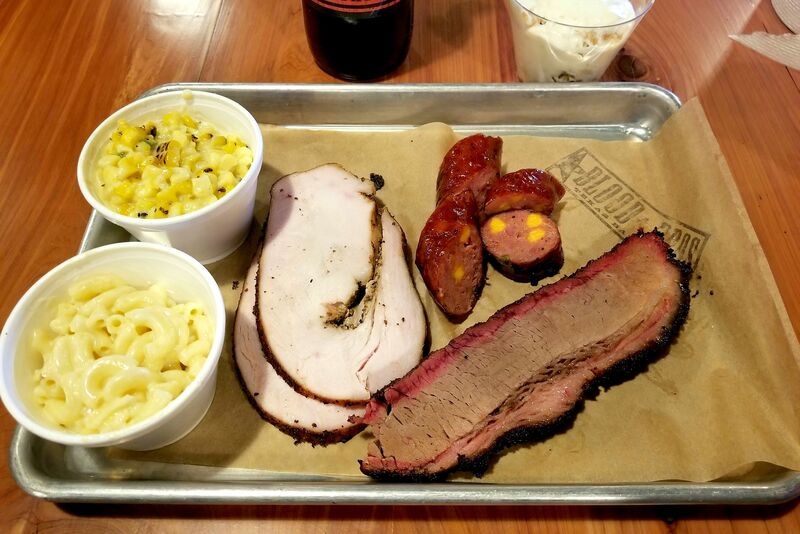 If you, too, are white and like some heat, we recommend requesting the highest, "four pepper" level. 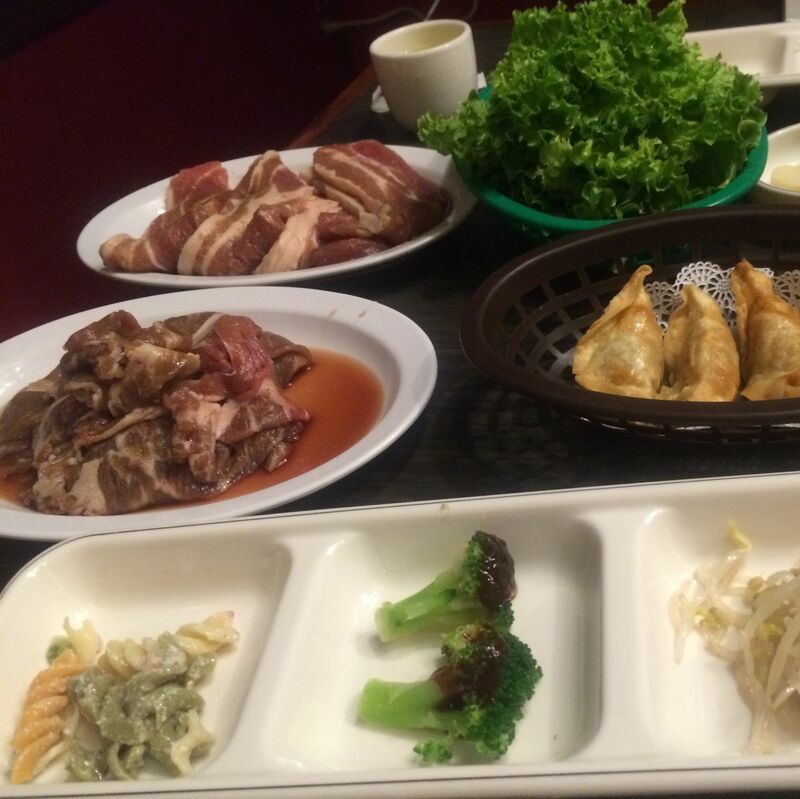 Flower Piggy: As all-you-can-eat (AYCEKBBQ) devotees, when we're at places that don't offer that deal, we try to order combos to sample as many meats as possible. At Flower Piggy, this is more of a possibility for a small party than at BBQ Garden. 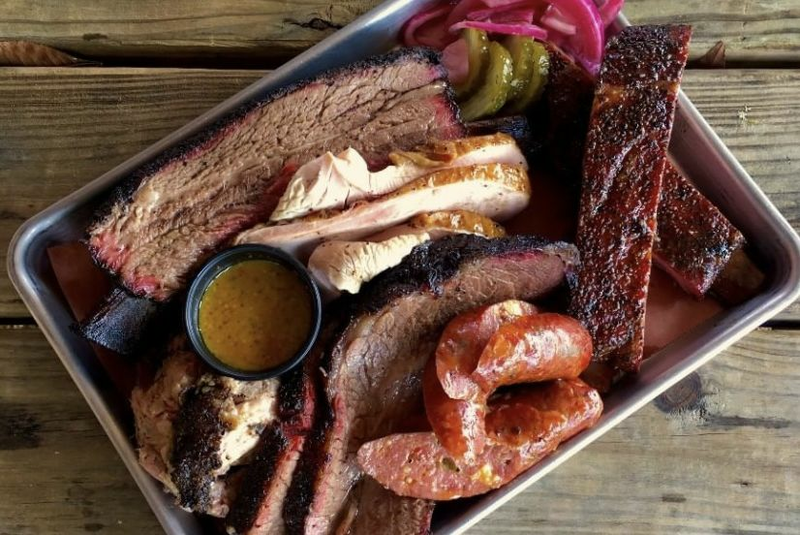 Our group of two was able to share heaping portions of beef short rib, marinated pork and chicken for less than $50, along with all the fixings listed above. Though it was a bummer that the beef wasn't marinated, the gingery pork and sweet chicken made up for it. And without overzealous involvement from the servers, we were able to cook them just how we like them. Conclusion: Our experience at Flower Piggy was more positive in nearly every regard. Early this year, the restaurant did have a troubling health inspection but has had no such problems since then, so we felt safe eating there and greatly enjoyed the experience. But was charcoal that much better? We have to reluctantly side with Hank Hill on this one. Though our fingers took on a tantalizing smoky fragrance that no amount of showering could dissipate after our KBBQ meals, the meat itself didn't taste much different from what we've tasted off a gas grill. 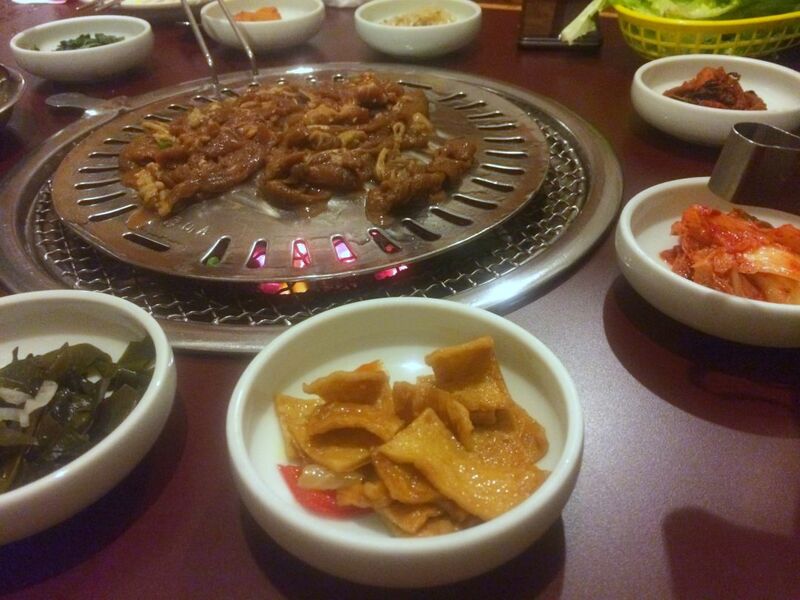 Purely in terms of flavor, we've had better tasting bulgogi in Houston than at either Flower Piggy or BBQ Garden. 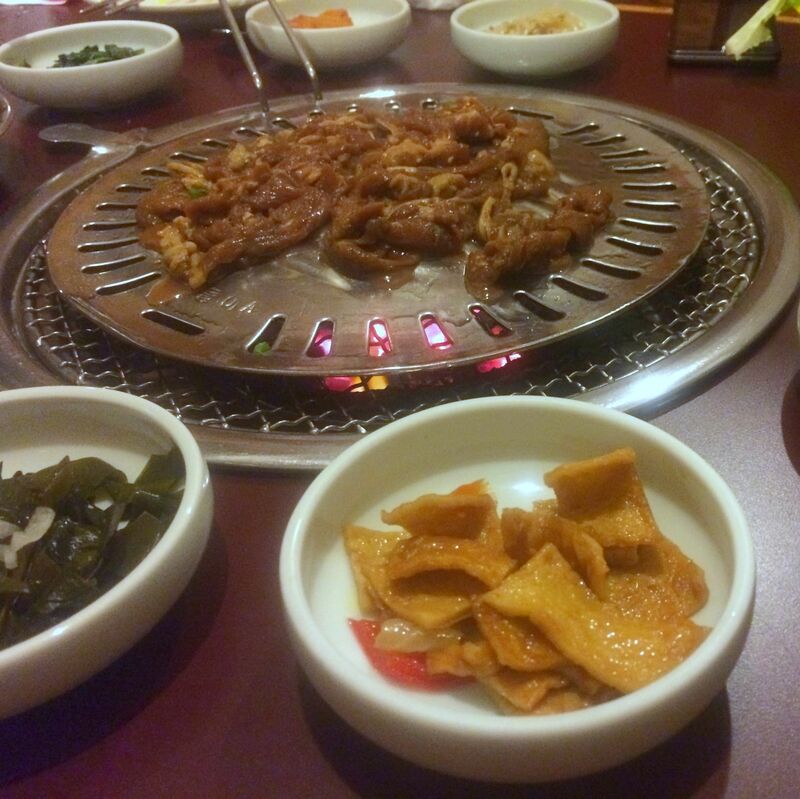 (So far, we especially like AYCE spots Korea House and Arirang Korean Restaurant.) But if you want to try charcoal for yourself, you no longer have to walk into the smoke blind. $$ Korean 10078 Long Point Rd. $$ Korean 411 Gessner Rd. $$ Korean 1949 Gessner Rd.